Our company manufactures safe and high quality products, all of the products must pass through our full-inspection and then ship to Amazon, so customers can be rest assured to use them. If customers have any problem with our products or any suggestions for our products, welcome to contact us and we would appreciate to improve it. 2.Reverse personal humidifier and open the cap then add enough water in it. Keep the bottom base stable when opening or closing the upper case with water inside of the small humidifier. Light modes setting-Keep pressing the button for about 2s, the humidifier will start to work and diffuse mist continuously. Press for 2s again, the humidifier is turned off. Start to work-Press the button for 1s, the default color light is on, press it again the lighting mode is transferred to gradually change. Press the button every next 1s, then you can get the light color you like. Add some drops of essential oil into the humidifier, then you can gain a diffuser at the same time. Please clean the humidifier twice a week or after 3-5 uses. Tap water may contains many micro-element, and it will remain in the humidifier. Please clean the humidifier in time. 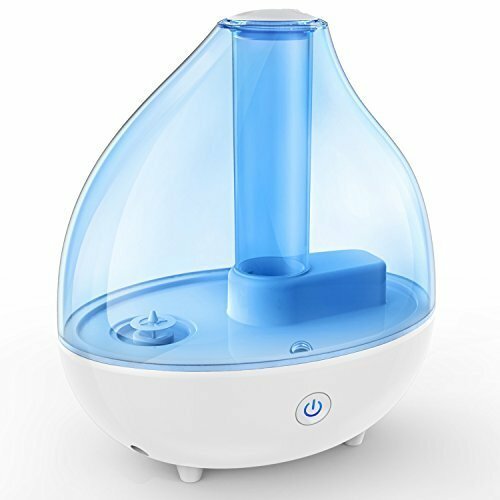 ▶EASY TO OPERATE:The cap of humidifier can be effortlessly removed, which is convenient to fill with water and a few drops of essential oil in the little rubber tank, helping you readily reap aromatherapy benefits at all times. ▶AUTO SHUT OFF:Using ultrasonic technology, provides 10 to 12 hours of continuous mist so that you can breathe easily and get more restful sleep. When the water level is lower than the minimum limit or the water tank is removed, the portable humidifier will shut off automatically. ▶CHANGEABLE LIGHT MODES:Choosing one of the 7 available steady LED light color modes, or allow the humidifier to rotate among them, by opting to use our humidifiers on their light-changing mode. ▶QUIET AND APPROPRIATE SIZE:Our design is crafted to be extremely quiet, making your overall experience even more pleasant! 1.7-liter tank capacity provides ideal coverage for bedrooms, offices, and other medium-sized rooms. ▶ADJUSTABLE MIST NOZZLE:360-degree mist nozzle makes them easy to adjust mist direction and speed to fit your comfort level. If you have any questions about this product by DONGSHEN, contact us by completing and submitting the form below. If you are looking for a specif part number, please include it with your message.